RyanAir is a well-known low-cost airline based in Ireland and is the largest airlines in the world in terms of passengers carried. The company primarily operates low-cost routes throughout the European continent though it has expanded in recent years to include destinations in Morocco. 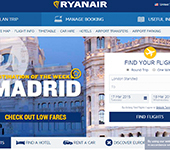 For more details, travelers can find a complete flight map on the RyanAir website. RyanAir has received some criticism for its strict baggage policy which it has clarified in recent years. Currently, the only baggage which RyanAir allows for free is a single piece of carry-on luggage weighing up to 10kg and with a maximum carry on size of no more than 55x40x20cm. RyanAir has recently also begun allowing a second personal item such as a purse or laptop bag to be brought on board. There are, however, baggage fees for checked bags which start at €15 for bags checked online and €30 for bags checked at the airport itself. RyanAir also requires passengers to check in online before their flights and print their own boarding passes to be presented at the gate. 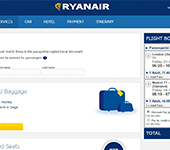 As is the case with most low-cost carriers, RyanAir's website is primarily based around a flight search function and a display of the unbelievably low fares which have made RyanAir so successful. 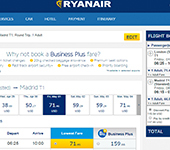 When booking flights on Ryanair, passengers can opt to see a calendar of fares and find the lowest prices offered during a given period of time.